Today I'm going to talk a little about choosing and obtaining your domain name. This is something that artists seem to struggle with...I mean, we're artists, not tech people, right? So what is a domain name? It's basically your "home" on the web. Looking a little deeper, it's an alias for numerical address that tells other computers how to find you...but can you imagine having to tell your customers to come visit your site at "192.31.27.123"? Name servers on the internet are like big phone books. They can associate those awful numerical addresses with something friendlier...like "www.katkramer.com." In the past, there were only a few different types of "top level domains" (TLDs). You might recognize addresses ending in ".com", ".edu", ".mil", or ".org"....these were the original generic domains. Now there are a lot of other ones coming...something like 617 over the next couple of years. Things like ".baby", and ".gift". As you might expect, ".jewelry" is coming, but speculators will snap up a lot of these names and put them up for sale at a premium price. Whatever you do, DO NOT PUT YOUR NAME ON ANY LIST for these domains. They are not available yet. There are companies out there offering to put your name on a non-binding reservation list, but what that means is that they'll grab it for you, then mark it up, and try to sell it to you at a premium. Notice in the small print..."non-binding" and "no guarantee." to dot-com, or not to dot-com? For example, you want to avoid long addresses. For example, what would be easier to remember and type, "www.katkramerjewelrydesigns.com" or "www.katkramer.com"? That's pretty easy. The shorter one. But if you can get some variation of your desired site name in a dot-com flavor, do it. If someone just types "katkramer" into the box, the browser adds ".com" by default. Dot-com addresses are still the most valuable. your name, or a business name? This is one we all struggle with. A guideline given to me by my jewelry teacher is that customers are generally willing to pay more for jewelry from a "named" artist. Now, she could work really hard at branding and make it work. However, instead of naming her site "Archaeologica," we incorporated the term as a graphic element on the main page. But we still used her name as the domain for her site. Here's why...if you knew that Lexi made jewelry—you talked with her at some show as you oohed and ahhed over her jewelry—but you lost her business card—what would you remember? "Some woman named Lexi who made jewelry." Could you Google that and find her site? Give it a try by clicking here ("Lexi Jewelry"). Because her website contains her name and is about jewelry, Google connects the dots and her site appears in second position on the search results. Notice her site name is not "lexiericksonjewelry.com", but the search engines can still tell that's what the site contains. That's because the Google is pulling text from the main page that includes the words "Lexi" and "Jewelry." If you really want to use something other than your name, think up keywords that are relevant to your business. For example, if I did wire-wrapped jewelry, and wanted to use the name "Kat's Tangled Dreams," would that be a descriptive enough domain name? Maybe not...but It's catchy...you might consider taking "Kat's" off the name, and simplify it using "tangleddreams.com" instead. Regardless of what name you choose, you would just want to make sure that you enter information about you and your jewelry or art in the meta description. Meta description information is not displayed on your page, but can be gathered by search engines to help customers find you. You could add your name as well as "wire-wrapped jewelry" and other keywords to the description. One other thing to note—the double "d" in the middle of "tangleddreams.com" could be confusing. You could stylize it in your marketing materials with "TangledDreams.com", which should work in all browsers (Internet Explorer frequently misbehaves!). I have a glass jewelry and art company called "Glasskatz." I was able to obtain the domain name and also the Etsy shop, and used it heavily for several years to market my work. Cute name, but The Bobby (my better half) just reminded me that every time I tell someone to go to the website, I have to SPELL the last part...people assume that it's "Glasscats." Or they forget the "z," and spell it "Glasskats." The "z" threw everyone off. However, it was catchy, and I made it work. I eventually did also purchase the glasskats.com domain. So back to Glasskatz, the name was unique, and it worked. However, when I started doing higher end jewelry that wasn't glass-related, the name wasn't as relevant. After a marketing discussion with Lexi, I decided to pursue registering katkramer.com. It wasn't available, so I registered katkramerdesign.com. While I was in there, I registered katkramerdesigns.com. You may be wondering...what about katkramer.com? I'll tell you about that later. I had another issue to consider...in addition to jewelry, I do web design, graphic design, computer training, and instructional videos. So "katkramerjewelry.com" was too specific. So if you do something other than jewelry, take that into consideration. Do you want to maintain two separate sites? A friend who has done this quite successfully is Kim Brill. She does beautiful graphic design and also amazing glass. 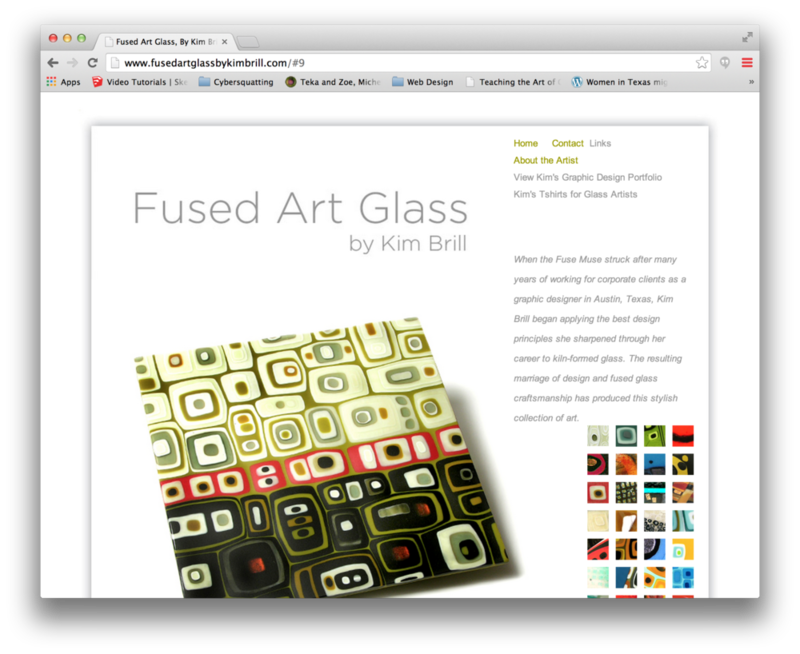 Her graphic design site is www.kimbrill.com. Her glass site is www.fusedartglassbykimbrill.com. 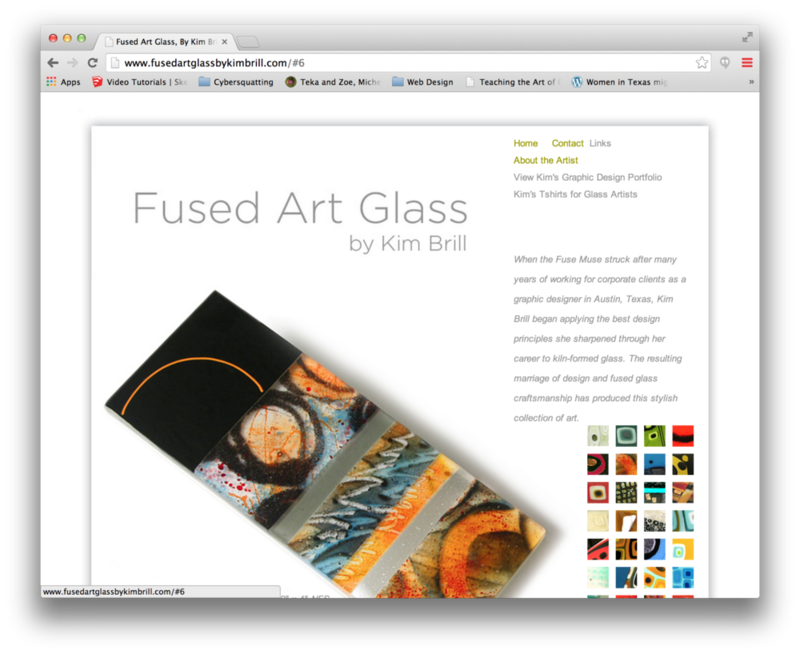 However, she has a link under the Fine Art tab on her graphic design site to her glass site. So if you're doing multiple businesses, you need to consider how your domain names tie together. If you're doing beaded jewelry and metalsmithing, you could very well have them on the same web site. But if you do accounting and jewelry, you might consider having two separate sites. I'll write more tomorrow...it's getting late!